Passengers for JetBlue experienced delays and long lines at LaGuardia (left) and Long Beach International Airports. JetBlue's website was back up after a power outage at the company's Verizon data center Thursday disabled the airline's network, grounding flights and stranding passengers at airports around the country, the company announced on its blog. According to BlueTales, power was restored to the data center and JetBlue was working to "fully restore" the company's systems "as soon as possible." JetBlue said the data center that went out was operated by Verizon. "While still experiencing system issues due to a Verizon Data Center power outage, booking flights is now restored on JetBlue.com. Customers looking to check in for flights can visit http://checkin.jetblue.com [sic]," the company reported. Earlier Thursday, JetBlue's customer support systems, website, mobile apps, check-in counter and gate systems were impacted by a network-wide outage. The company announced the outage on Twitter. "We're experiencing intermittent network issues due to a data center power outage. We're working to resolve & should be restored shortly," the tweet read. JetBlue's website displayed an "Internal Service Error" message. Passengers took to social media to express their frustration as some travelers reported their planes being grounded after boarding while others couldn't check in altogether. 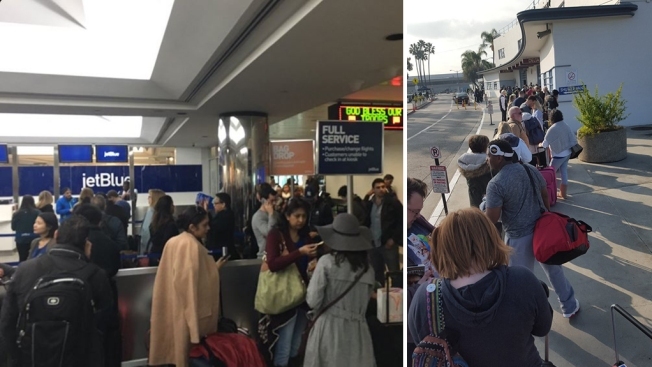 Travelers tweeted pictures of long lines from airports in California to Boston, while one passenger called New York City's LaGuardia a "nightmare." JetBlue did not say how long the outage would last, but did respond to a customer's tweet urging passengers to arrive at airports for their scheduled departure flights. Still, residual JetBlue flight delays due to the outage can be expected to linger for much of the day. @JetBlue at RIC airport and we are told your entire system is down and no one can check in. What's up? @JetBlue systems down at JFK- all flights delayed indefinitely, but hopefully will get to LA sometime soon!! I am stuck in Charleston, Sc with my family. we are trying to get to Munich, Germany. how mich longer until the system is fixed?